Radiation therapy uses targeted high energy x-rays to treat patients with cancer and is one of the main treatments for cancer. This course qualifies you to work as a radiation therapist – the health care professional who, together with the other multidisciplinary team members, is responsible for the preparation and delivery of a course of radiation therapy. This degree provides you with the required scientific understanding and the critical clinical and research skills to adapt to the ever-changing medical environment. Radiation Therapy: The course for you? 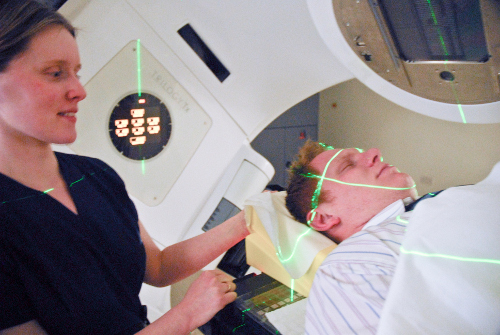 The radiation therapist requires very specialist skills and the role can be physically and emotionally demanding. The development of your clinical skills requires you to be interested in patient care. You will also need to have a keen interest in the field of science. Working as a radiation therapist will also require you to have good interpersonal and technical skills. Radiation Therapy is an innovative profession, with constant technological and patient care advancements. This programme will provide you with the necessary academic and practical skills to work in this patient centered healthcare environment. The programme is delivered by experienced and enthusiastic academic staff, whose focus is on providing you with a research-led, student centered, quality learning experience. The small class sizes in this programme facilitate a close working relationship between students and staff. As a graduate radiation therapist you will be the main point of contact for the cancer patient during the course of their radiation therapy treatment and you will be involved in many aspects of their care during this time. As radiation therapy is expanding in Ireland and internationally so too is the opportunity for career development, making this an exciting time to be entering the profession. Graduates from this programme work in radiation therapy departments in Ireland; UK; Australia; New Zealand; Qatar and Saudi Arabia, to name but a few. The broad scientific and clinical content of this degree, in combination with the graduate attributes of competent reflective practitioners; lifelong learners; critical thinkers and problem solvers has facilitated graduates to work nationally and internationally in research and development, medical industry technology and marketing and academia. This four-year honours degree gives you a broad academic base on which to develop the clinical skills of radiation therapy. You will be able to analyse, evaluate and make clinical decisions and to initiate, participate in and encourage research in oncology and radiation therapy. There are both theoretical and clinical components to this degree. The contact hours are high in this course and the subjects are taught through lectures, laboratory-based practical sessions, workshops, tutorials and clinical placement in the hospital setting. A significant clinical component is integral to this course. The clinical sites can be found here. Part of the clinical placement takes place during the vacation periods and clinical placement consists of 35 hours per week. Students are placed in radiation therapy departments across the country. The costs of placement outside Dublin (including accommodation and travel expenses) must be borne by the student. This programme use a variety of assessment methods, including written end-of-year examinations, continuous assessment, individual and group project work, oral examinations, reflective journals and workbooks. A clinical portfolio and research dissertation are substantial components of the assessment processes in your final year. Students have the option to undertake a clinical placement in a European radiation therapy department in the summer vacation of the third year. “I now work as a Radiation Therapist in an Irish Hospital. My position requires me to work as part of a four-person unit delivering safe and accurate radiation treatment to patients suffering from cancer. In addition to delivering a patients treatment, we also monitor and advise patients on the management of any side effects or concerns that may arise during treatment. We liaise with and work alongside other health professionals so to ensure that patient’s side effects and needs are addressed promptly and the impact limited. Note: There is a charge of €40 for membership of the Irish professional society for Radiation Therapists (IIRRT). Note: All students undertake clinical placements outside Dublin and will incur additional travel and accommodation costs.